I've been working lately on a round robin "mermaid" swap block. I'm the first to touch the block (well, after the owner). 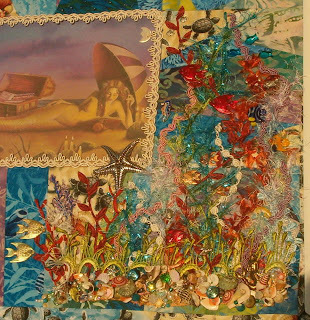 She added some lace and a large starfish to the center. 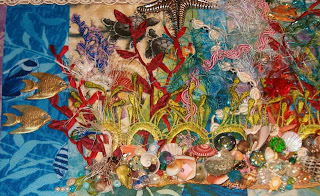 Upon it's arrival, my head was immediately filled with a definite idea for a coral reef filled with fish...but I was nervous because it is not a traditional CQ effort (but I just love the artsy blocks so much more!). This swap is not a hidden swap, as we are posting photos and such for inspiration...so I talked to the block owner to describe my idea and she was very accommodating to my vision. 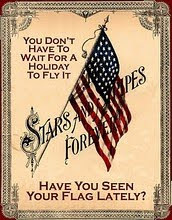 For which, I am so very thankful! Here is the whole reef, and three closeups for your enjoyment. Now, I'm going to play around with that sea chest in the block center, and get ready to pass this along in a week or so. Here's a little combination of Stitch #43 and #41. 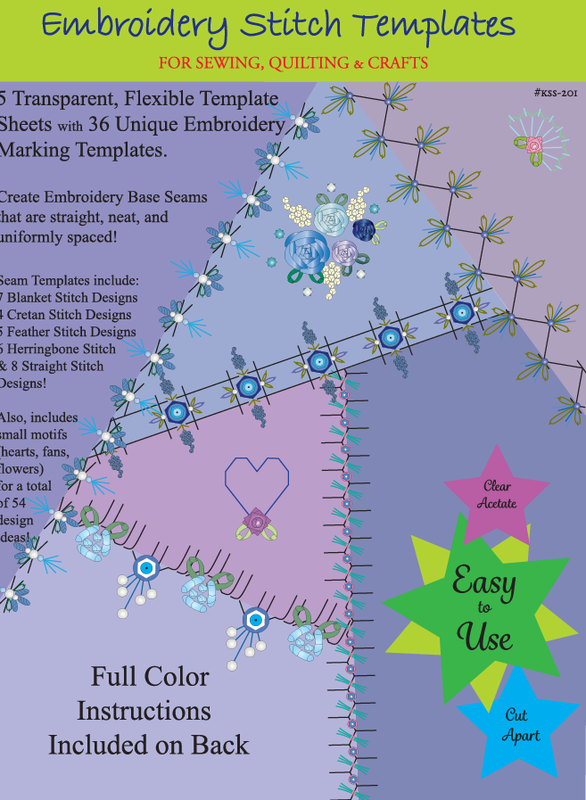 It is a little more visually complex because the design keeps changing, but is very simple to stitch. 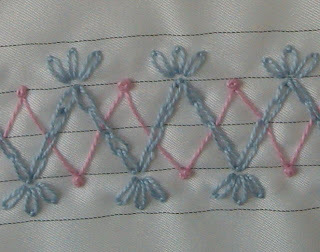 This is a very simple stitch. It is good to use on smaller projects like CQ hearts, to cover ribbon. 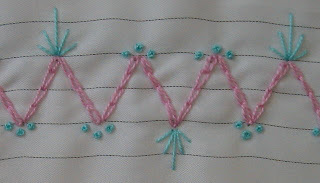 The ribbon is placed first, and the zigzag is stitched over the top. 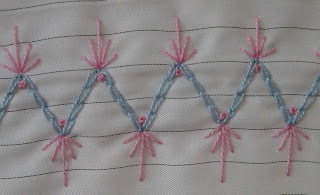 If you use a straight stitch zigzag, the ribbon can be woven under the stitching. 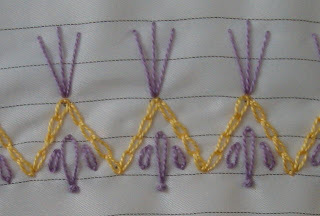 If you liked (and understood) my stitch directions at Stitch #40, then you'll really like doing this stitch as well! 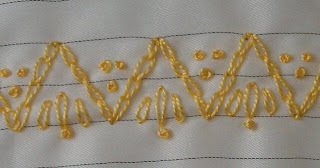 It is made of two "rays"; one smaller and one larger...with a french knot in between. 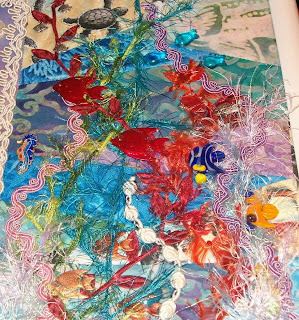 I stitched all the smaller rays then came back and stitched the larger ones, leaving space for the knot between them. 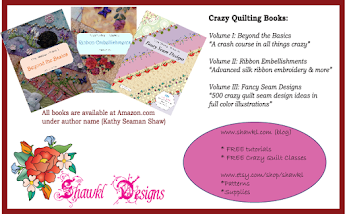 If you've been stitching along with me, then you surely already know that I just love this little five ray fan. It just looks so good with so many combinations! 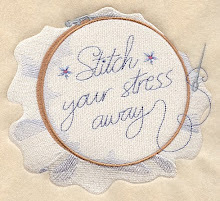 And, it's so easy to stitch! I do the center vertical stitch first, making sure it is the height I want. Then, I imaging a base line at the bottom, so I can visualize a 90 degree angle. Next I stitch the outside rays...at 45 degrees of the center vertical and this imaginary base line...and make it about one quarter to one third the length of the center vertical. Lastly, I look at the tip of the center vertical and the tip of the 45 degree angle...and imagine a line between these two. The last stitch is started on this imaginary line and ends at the base of the other two stitches...and is placed halfway between them. Hope you can figure out what I'm doing by these directions! All of the Easter eggs on blog posts make me happy, as I love pastels! So, the next few continue along those colors. We're still using the medium zigzag template. 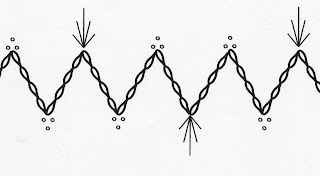 This stitch give plenty of room between the peaks of the zigzag and straight stitch area. 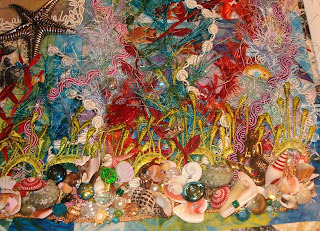 It would be super to add a silk ribbon rose or larger bead there. The large teardrop should be stitched a little longer I think, but I'm sure you'll get the idea. I had intended to have the straight stitches taller, but somehow forgot that when I was actually stitching. 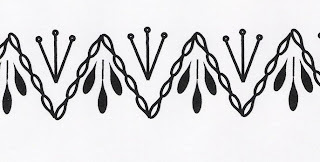 These chain zigzags are easy to do if you strive to make the side of the zigzag the same as 4 stitches...two will get you to the middle, and two will get you to the top/bottom...making the zigzag uniform. 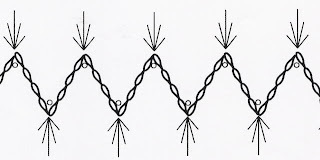 Stitch the straight zigzag before the chain zigzag. 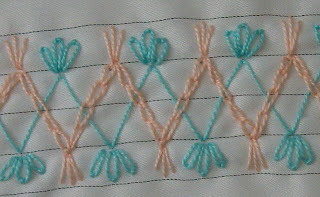 This is a good stitch to use a variety of colors in. 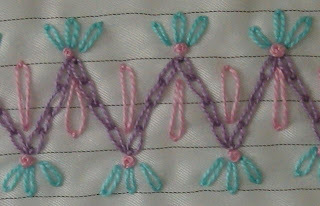 The medium template is the best to use for the chain stitch, as it has more width than the small template. The large teardrop could be easily replace with a large bead for a beaded version. This stitch is a little more open and I like that better. 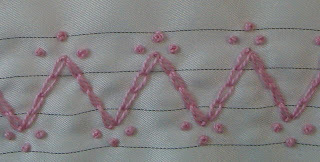 Still just straight stitch, lazy daisy, French knot...using the chained zig zag as our base stitch. I like this light varigated thread, but a mix of red, white, blue would also be neat for a patriotic block. What colors will you use? 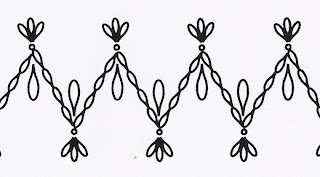 Get comfortable with the chain stitch, we're going to be doing a few more of these in the stitches coming up next. 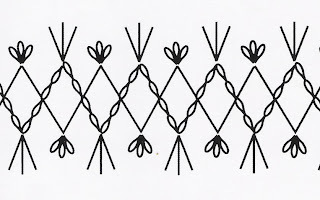 We've been using the zig zag as our base stitch, and now let's change it up a little bit. 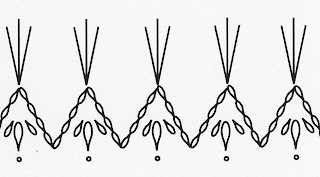 Instead of straight stitch...we're going to us a chain stitch. It is a very simple stitch...close to a lazy daisy...so you should not have any problems doing one. I like to anchor my chain at the top and bottom of the zigzag to keep it looking neat. This first stitch is a little tight. If you want it to have more space, use the medium zigzag template and/or size 12 perle cotton. I used size 8, and IMHO it takes up too much room.